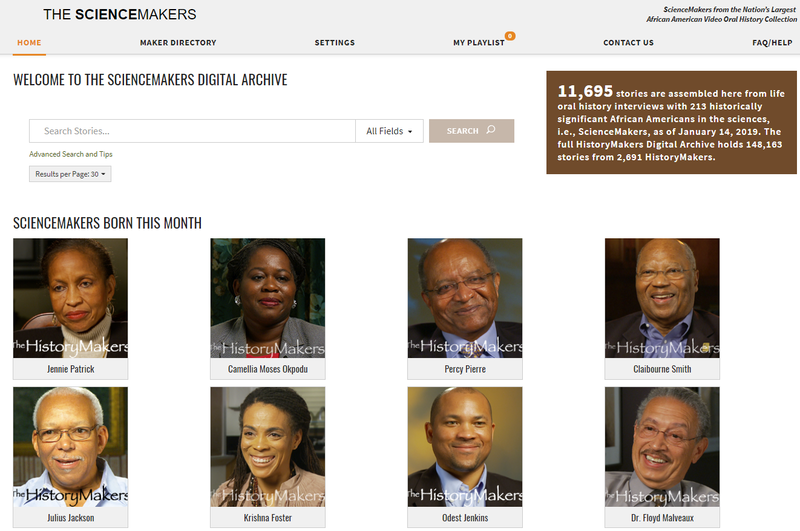 The HistoryMakers Digital Archive is an easy-to-use online database of thousands of African Americans from a broad range of backgrounds and experiences. Unlike other primary source resources, The HistoryMakers Digital Archive provides high-quality video content, fully searchable transcripts, and unique content from individuals whose life stories would have been lost were it not for The HistoryMakers. • and the stories of Harry Belafonte, Mellody Hobson, Savion Glover, Melissa Harris-Perry, former U.S. Attorney Eric Holder, Charles Blow, Whoopi Goldberg, James Earl Jones, and President Barack Obama (while he was still an Illinois State Senator), among thousands of others. The ever increasing corpus – only searchable within The HistoryMakers Digital Archive – has now been licensed to colleges, universities, and public libraries in the U.S., making this unique content available through the click of a button. 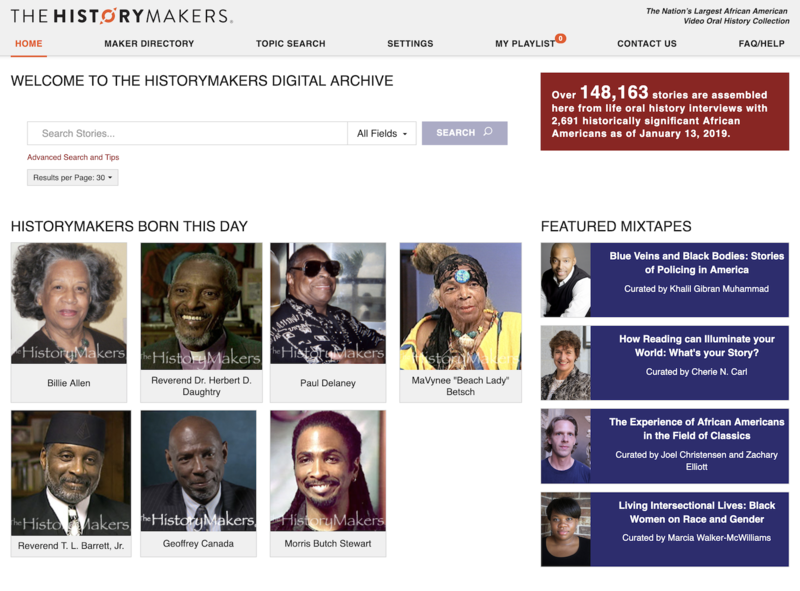 The HistoryMakers Digital Archive is the realization of The HistoryMakers efforts to mainstream African American history, and bring it to the forefront. The ScienceMakers Digital Archive contains videotaped life oral history interviews with 213 of the nation's top African American scientists including NASA mathematician Katherine Johnson who was featured in the Hollywood movie “Hidden Figures” and atmospheric scientist Dr. Warren Washington, one of the leading experts in climate change. With $2.3 million in funding from the National Science Foundation, the ScienceMakers interviews were completed in the scientists’ homes, offices or laboratories. Representing the fields of science, technology, and mathematics, the resulting collection is now the largest video oral history collection of African American scientists in the world. The ScienceMakers’ interviews are also featured in their entirety with over 900 hours of first person stories of family background, schooling, career paths, mentors, adversities and successes and scientific accomplishments. The scientists interviewed represent a wide variety of professions: Aeronautics & Astronautics (5), Physics (46), Chemistry (33), Engineering (28), Mathematics (20), Astronomy (2), Biology (23), Computer Science (20), and Earth Science (9). They also represent diverse geographic areas with the highest density residing in twelve areas including Los Angeles, California (12), San Francisco, California (14), Atlanta, Georgia (19), Norfolk, Virginia (6), New Jersey/New York City (14), Boston/Providence/Hanover (22), Washington, D.C. (34), Baltimore/Philadelphia/Delaware (23), Michigan (12), Southeast Texas (11), Durham, North Carolina (6) and Chicago, Illinois (8). Users of the ScienceMakers Digital Archive say they find the stories of the intriguing, inspiring and educational. There is NO cost to access the ScienceMakers Digital Archive as long as you become a free member.